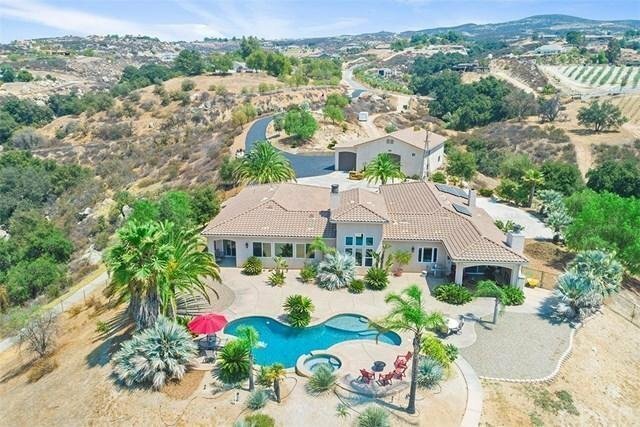 Temecula Wine Country Perfection with panoramic views. This beautiful pool home is in Glen Oaks Country right above Glen Oaks Hills and is right before Rancho Glen Oak but has no HOA and Low Taxes. Paved Roads all the way and Rancho Water (agriculture water rates and paid for solar). This home has 3796 +/- sq feet of living area with three large bedrooms and three half bathrooms and a large office. It also has a 3200 sq ft RV garage / shop with room for the biggest of RV Motor Homes and six or seven more cars, boats or toys. Inside this home is a gourmet kitchen with slab granite countertops a 36" Subzero refrigerator and another 36" Sub Zero Freezer, Thermador Pro Range and double ovens and loads of counter space and a walk-in pantry. Beautiful Alder wood interior doors and upgraded cabinetry and built ins throughout the home. Vintage Doug Fir beams in the ceiling and an attached additional three car garage with epoxy floors and storage. The shop also has a back-drive way off Via Calina with room to add horse corals or even a guest house if you want. The shop also has a half bathroom and a small upstairs studio apartment. The back yard is amazing with an open California living room with fireplace and TV and party area sounding the beautiful pool and spa with forever views of Temecula Wine Country. This home is a true gem with every dream upgrade done. Come make it your own.